2.0 Japanese and English Dolby Digital Soundtracks. Welcome to perhaps the oddest police procedural you are likely to see. One where the criminal definitely has an effect on the world but proves frustratingly elusive to catch or even quantify as a person. Written and directed by Satoshi Kon this marks his entry into telling TV series stories rather feature length films. Indeed, as he notes in the interview on this disc, the series is largely the use of ideas left over from the creation of 'Perfect Blue', 'Tokyo Godfathers' and 'Millenium Actress' that were simply too good to waste. For fans the resonances extend to include characters from the various films making cameo appearances in the series. But don't be concerned if you haven't, such references are either kept in the background or used in such a way that knowledge of the films isn't required. What is brought to the foreground is the ensemble cast whose lives intertwine. As he has done in his films Satoshi brings us into the subjective reality of the character whose life we are following. It is a very deftly done trick to introduce a character, their history and then also twist that so not only do we get a surprise but also reveals more about the character at the same time. Full use of a variety of visual tricks from distorted vision, to melding of dream and reality through deft cuts and panning is used. If you have seen his films, none of this will be particularly new but you will relish the opportunity to spend a goodly six odd hours in the world these characters inhabit rather than the more typical two hour film bursts we have had before. Part of what makes it all work is the delicious sense of humour that infects the stories being told. It isn't so much that we are laughing at the fates of the characters but more laughing almost with them as they appreciate the situation that they find themselves in. It's a fun mix to watch that not only makes us laugh but also accurately skewers modern life and inanities we get caught up in. Perhaps what makes it a most special series for me isn't just the excellent story but the way in which is has been animated. There has been increasingly two major schools of thought in anime, Production IG seems to be an excellent champion of the first school which involves concentrating on acutely detailed objects within the world to try and achieve close to photorealistic scenes. It is an approach that produces some stunning imagery but usually comes at a slight cost in terms of the animation of moving objects. Production IG has done a lot of work to develop computer assisted techniques that allow them to handle machinery with ease. But people suffer a little to my eye. What Paranoia Agent does, using Madhouse's animators, is to go the second route and present a less detailed but slightly more stylised world while providing more fluidity in both movement and expression. Such is horribly important in such pyschological tales as those Paranoia Agent wants to tell and it is a testimant to the skill with which it is done that characters properly emote and act. Watching the sleazy reporter careful drop both inneundo and try to wheedle information out of people becomes a pleasure to watch as you see the lecherous thoughts flit across his mind rather than merely hearing such in the voice while the more bland face conveys only broad emotion. This has two other important follow on effects. First is the removal of visual 'shortcut' icons to indicate mood, characters look the emotional state they are and their faces are detailed enough to be clear on what that state is. Secondly is the change in the audio tracks to finally have completely natural vocalisation. I've commented on this with regards to the Haibane Renmei dub which I was lucky enough to ask the English dub adaptor, Jonathan Klein, about why the vocal expressive gasps still persisted despite the similar high quality of animation present in Haibane Renmei. 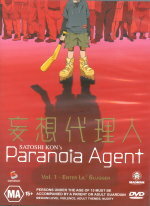 His comment at the time was to point to Paranoia Agent as being a show where the director had understood that the animation quality itself didn't need audible over the top reinforcement. I agree with him on that count and it marks, for me, the begining of the next big step that produced for TV animation has reached. Hopefully this level of fluid and expressive animation will become the norm. So what do you get on the disc? Well a nice crisp 16:9 video transfer, you can get some ghosting issues as this is an NTSC to PAL conversion but you have to pause playback and hunt a bit to notice them. Audio wise we get 2.0 Dolby Digital tracks for both languages. Both are very pleasant mixes that cater well for the heavily dialogue centric nature of the show. A great deal of effort has been put into the English dub matching note for note the Japanese dub so kudos here for the hard work Mr Klein has put into the dub - his being requested by the creators to handle the dub seems to have paid off well with a strong dub. A multi- angle storyboard comparison is available allowing you to see how the finished product compares with the early design of the show, interesting for animators and those curious about the process. But the real gold of the extras comes in the form of the Satoshi Kon interview, done for a day time current affairs show in Japan, it is an introduction to what the series aims to do as well as letting Satoshi talk about the source of the series' ideas. It is a nice taster for the commentary tracks on volume four where Satoshi gets to talk about the finale three episodes and the series as a whole. 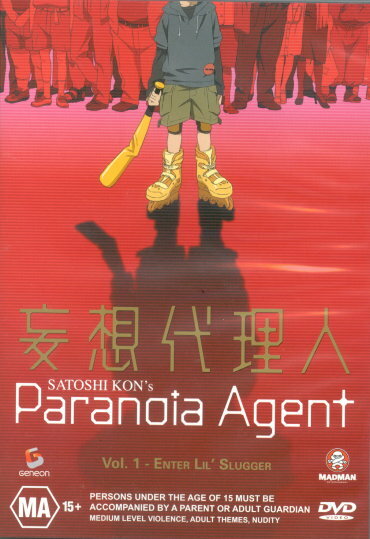 All in all Paranoia Agent is one of those series that should be in pretty much any anime collectors collection. It is a breath of tightly plotted, pleasantly humorous and socially relevant anime that does a police prodecural like you simply haven't seen before.